Rejuvenated by the departure of former Swindon manager Danny Wilson, Sheffield United deservedly took all three points to all but book their play-off place and leave Town anxiously looking over their shoulder at the chasing pack from 6th position in League One. The Blades are a bullying, bruising team and they quite simply battered Swindon in a breathless first-half display that fully justified their decision to hand over the reins to Chris Morgan in midweek following defeat to Crawley. Writes Dan Hunt. Miraculously, Town made it to half-time with only a one goal deficit to make up and a much improved second-half performance gave the 1,248 travelling reds something to cling on to – until Dave Kitson put the game beyond Swindon in the 82nd minute. Credit to Kevin MacDonald where it’s due, his team selection and tactics showed attacking intent from the start but the eleven chosen players need to take responsibility for an error strewn first period. Over and over again, Town’s defence were carved apart with ease by their steel city counterparts. In converting to the much debated 4-4-2 formation, central midfielders Alan Navarro and Dean Parrett made way for Raffa De Vita and James Collins. If he wants to make it as a lower league footballer, Mr Parrett would do well to look at the committed efforts of Nathan Byrne and Massimo Luongo since arriving from White Hart Lane. For now, Swindon are better off without a young Premier League diva, even if it means that the substitute’s bench was populated by two Youth Team forwards in Connor Waldon and Mark Francis at Bramall Lane. Central midfielder Kevin McDonald had already shot over from a Jamie Murphy cross before Sheffield United landed their first meaningful blow on the Swindon goal in the 3rd minute. A Tony McMahon free kick from wide on the left, curled towards the back post, got a slight touch from (I think) Dave Kitson before striking the left hand post – much to Wes Foderingham’s relief. In between the chaos, Massimo Luongo tested George Long from 20 yards but the young ‘keeper was up to the task in the Blades’ goal. Almost immediately after Luongo’s effort, excellent goal-line blocks from Aden Flint and then Nathan Byrne kept the scores level. A simple long ball over the top was allowed to bounce by Darren Ward and Chris Porter outmuscled the former Millwall man to strike on goal from the right edge of the box. While Porter’s effort was cleared by Flint, the follow up opportunity was by far the better chance and Nathan Byrne did fantastically to bravely dive in and block Dave Kitson. With barely ten minutes on the clock, Swindon were on the rack and lucky not to be two goals down. Twice more Wes Foderingham had to be on his mettle to deny a low Jamie Murphy shot and then a weak Chris Porter effort after being played through on goal. His strike partner Dave Kitson was waiting for a tap in at the back post if Porter had only looked up. Repeatedly, Sheffield United targeted Nathan Byrne’s lack of height on Swindon’s right hand side and it was a clever ball over the Spurs loanee that led to the Murphy effort. The Blades had gone four home games without a goal before the visit of the Robins and my only forlorn hope from a terrible opening period was that the home fans were getting that familiar, “the ball just won’t go in”, feeling! Undeterred, the United players continued to press and the impressive Murphy tested Foderingham’s handling skills with a stinging right foot drive in the 13th minute. Perhaps the best chance of the half was still to come though. The referee, Eddie Ilderton, was not endearing himself to the Town faithful with a series of trivial free kicks awarded to the home team. While Swindon were complaining about a Darren Ward ‘foul’ in the 20th minute, the Blades should have taken the lead through Doyle following a clever Dave Kitson quick free kick. Doyle inexplicably rolled wide of the far post though and Town’s incensed players surrounded Ilderton once more to protest until their faces turned the colour of the away strip! Ill discipline seems to be a recurring theme since the departure of Paolo Di Canio as manager. Not only did Swindon pick up seven yellow cards but previously reliable players like Foderingham are now regularly partaking in ill disciplined activities – such as trying to dribble around centre-forwards when receiving back passes. Luckily for the former Crystal Palace ‘keeper, Chris Porter failed to punish his mistake in the 33rd minute. Strangely, Sheffield United took the lead following Town’s best spell of the first half, culminating in a James Collins rising shot tipped over the bar by Long and a couple of over hit corners delivered by the left boot of Gary Roberts. Another contentious free kick award by Ilderton on the right wing led to the straw that broke the camel’s back. Despite claims that McCormack and then De Vita had been fouled, the free kick went United’s way and McMahon’s precise delivery found Porter who bundled home to send the home fans wild. The half time lead could have been extended but Ryan Flynn’s burst through on goal was cleared off the line by McCormack, who proceeded to give away a free kick on the edge of the box in the melee. McMahon curled the resulting free kick against the woodwork and somehow a shell shocked Swindon went in to the break one goal behind. The interval definitely benefited Kevin MacDonald’s men and the second half performance was a vast improvement on the first. The Blades didn’t have a clear cut chance until thirty minutes in but Town’s major failing was not turning territory and possession into shots on target. Nathan Byrne shot wide from distance following good Swindon pressure in the 48th minute but the next significant chance didn’t arrive until Adam Rooney entered the fray just before the hour. After collecting a Gary Roberts cross from the right, the Birmingham loanee could only scoop over the crossbar from 12 yards. The introduction of Luke Rooney, replacing Roberts on the wing, was a popular move with supporters and it was from a Luke Rooney corner that Ward nodded wide at the back post with twenty minutes left. The header was clearly deflected wide off a Sheffield head but alas, the officials saw otherwise in their infinite wisdom. A misplaced Ferry pass almost put a goal on a plate for Dave Kitson but great tracking back from Ferry himself denied a shooting opportunity for the experienced forward. With 77 minutes on the clock, good work from Ferry at the right end of the pitch offered Luke Rooney the chance to drift inside and shoot but his right foot shot was dragged wide of the near post. A minute later, a smart Andy Williams turn in the box was stopped unfairly according to Williams but the referee disagreed and promptly booked him for diving. My personal view was that it was neither a penalty nor a dive, simply a coming together. The immense frustration caused by failing to breakthrough was compounded by the head of Dave Kitson as he expertly diverted another sublime McMahon cross from the right into the ground and into the roof of the net. The goal killed the game and all that was left to cling onto was the promising performance of debutant, Mark Francis, who adapted well to being asked to play on the left of a four man midfield following his entrance in the 72nd minute. Francis even became the Swindon man to get a shot on target in the second half after being fed by Ferry on the left hand edge of the box with minutes remaining. His low effort was well struck and forced a smart save out of Long. 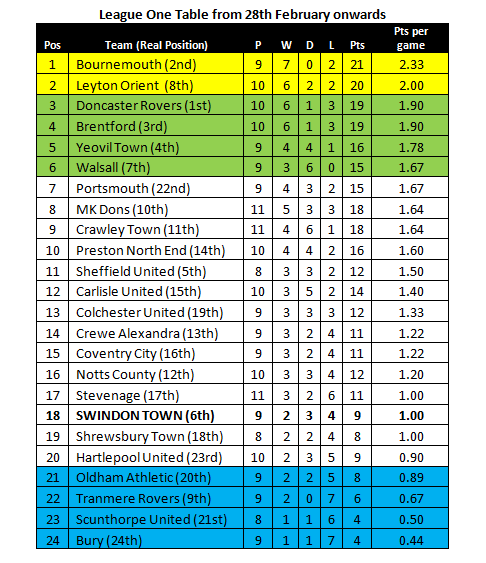 Above – League One table based on results since Kevin MacDonald took over as manager of Swindon Town on 28th February. Under MacDonald, Swindon are the 18th best performing side in England’s third tier. My own personal view is that he’s not up to the job but we may have to wait until fifteen games into next season before Jed McCrory and Co. admit their mistake. I don’t care if this makes me a doom-monger; I want what is best for Swindon Town. As much as you can after nine games, you get a gut-feeling about a man, and my gut-feeling is that MacDonald is too much of an apologist, too inherently negative, to be a successful football manager. Years of coaching youth and reserve teams where results are not important seem to have condemned Kevin to accepting mediocrity and once again, this isn’t good enough. I’m in South Africa but follow the Town diligently so it’s great to get reports like this. My other source of information is the Sky Sports website which indicated that seven town players were booked (confirmed in this report). How does this affect us with possible suspensions? I also saw a report on Sky News that your young friend Parrett had cut his loan spell short so I was surprised to see that he was playing. Well, now it’s quite simple, we have to win each and every game to make the play-offs however I’m not too confident of progressing should we achieve this goal. Sad end to a season that promised so much. good to know we have supporters following avidly from all the way in South Africa. Do you also post on http://www.Swindon-Town-FC.co.uk? In which case, I’ve seen plenty of your posts before. Regarding suspensions, I don’t think any of the individuals booked are set to incur a suspension – the squad is already thin enough as it is! I believe any club that receives more than 6 yellow cards incurs a fine however, so the club will have suffered in one way at least. Just to clear up the confusion, i said and i quote – “central midfielders Alan Navarro and Dean Parrett made way for Raffa De Vita and James Collins”. You’re correct in thinking that Parrett was sent back to Spurs in the week. Finally, I agree that it would a terribly sad way to end what promised to be a remarkable season. 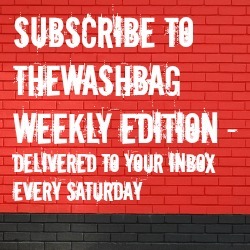 As I’m sure several Washbag writers will attempt to document once the dust settles on this season, there have been many many off field issues which have also helped derail the Swindon train this season! Perhaps I’m too hasty to level criticism at MacDonald but regardless of situation, for matters on the pitch the buck always stops at the manager. Tomorrow night is a huge game. Yeah, I’m the same Alan that also follows and posts on http://www.Swindon-Town-FC.co.uk Love the contributions from Richard & John as well as others. Don’t think there are toooooo many Swindon supporters residing in SA called Alan 🙂 although a supporters club was started here when we were in the dizzy heights of the old Div 1. That was a loooooong time ago though.